Only recently, 300 years later, scientists came across the treasure that had been preserved in this container: It was not about a Chinese, but a Siamese event from 1704, thus being one of the few well-preserved Siamese original historical documents of this time. The exact findings had recently been presented in Bangkok by Barend Jan Terwiel, among others at public events at the Siam Society and the Chulalongkon University. August the Strong lived from 1670 to 1733 and presided one of the largest courts in Europe. He assiduously collected furniture, paintings, rugs, silverware and much more. One of his collections was Chinoiserie; of which most ended in the present-day collection of prints, drawings and photographs in the Kupferstich-Kabinett of the residential castle (Residenzschloß) in Dresden, Saxony. Exactly 300 years ago, August purchased from Egidius van den Bempden, one of the lord majors of Amsterdam (and at the same time a Director of the Dutch East Indian Company) what was described as two Chinese paintings, kept rolled up tightly in a cardboard container. While preparing a catalogue of this collection of chinoiserie, a curator in Dresden came across this container and found that it was accompanied by a document in the Dutch language explaining one of these scrolls. The scrolls were filed as objects Ca 128 and Ca 129. The date of both scrolls had been estimated by the museum as “around 1710”. The indigenous account of the 1704 cremation procession is a remarkable piece of art and rich in detail. These two scrolls did not look Chinese, and almost a year ago, Professor Terwiel received photographs by Email with the request to help with the identification. As soon as he had seen the scrolls, he took the train to Dresden, for both scrolls apparently were created in early eighteenth-century Siam. 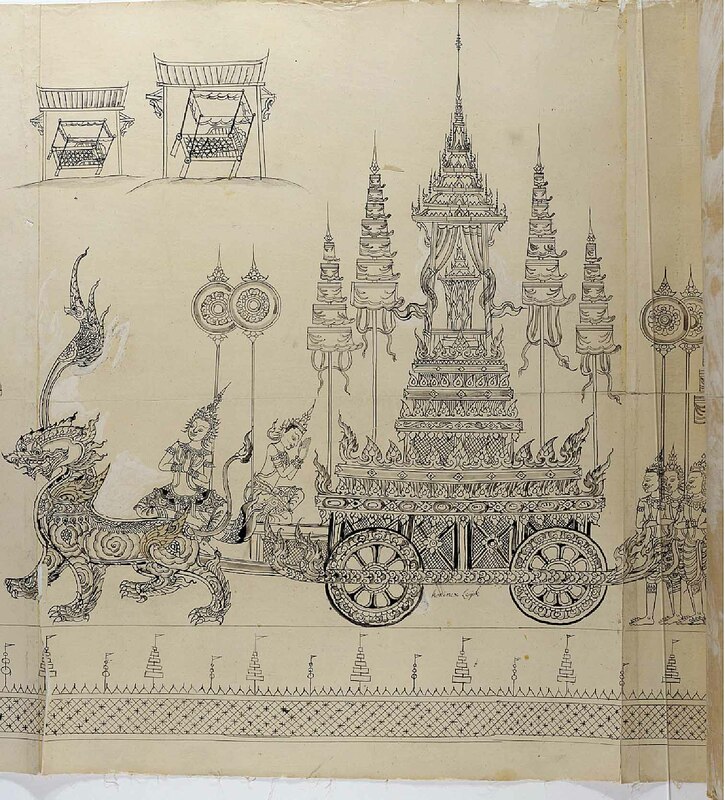 It was immediately clear that the scrolls depicted a Thai funeral, not an ordinary one, but its most elaborate form, reserved for royalty. 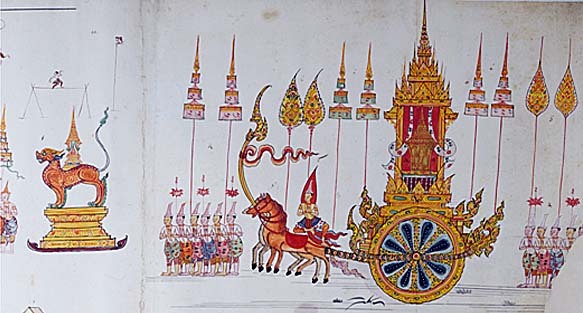 A separate explanatory text revealed that it concerned the funeral process on of „King Phra Throng Than“. In his talks in Bangkok, Terwiel identified this Thai ruler as the Usurper Phetracha who killed, among many others, Konstantinos Gerakis, the Greek advisor of King Narai, in the most brutal way imaginable. Terwiel also explained in his lectures for whom the scrolls were originally made, and he reconstructed the route by which Egidius van den Bempden obtained possession of these documents. The two scrolls are obviously related, they depict one and the same event. Nevertheless, they are dissimilar in many respects. The lengthier scroll Ca 129 (Thai) is made of ten sheets of thin white paper, all of them glued on a fine linen backing. Its total length is 370,3 cm., and its height varies between 50 and 52 cm. The illustration on this long scroll represents a procession, drawn in ink, applied with a fine pen. Only two small parts of one of the creatures pulling the funerary cart were given a golden colour, the rest is all in black-and-white. On this scroll a number of explanatory words have been written in the Dutch language, as well as some Thai words, transcribed in European script. The shorter scroll Ca 128 (foreign) measures 215 cm in length and its height is 42 cm. It is drawn on four large sheets of paper glued on to a strong piece of cloth. The figures and objects displayed in this scroll were first drawn in pencil, then in ink, and finally they were stained with various shades of green, red, yellow, orange and blue water colours; a single object, the large urn, was given a golden hue. The sheet of paper on the right-hand side appears to be a substitution of an earlier drawing, since the borderline is interrupted. Many single letters, ciphers and symbols have been distributed all around the drawn scenes. The short three-page document written in Dutch, mentioned above provides in 85 lines a systematic explanation of all these letters, ciphers and symbols. Both of them are familiar with the Dutch archives in The Hague. Prof. Phawan informed Terwiel about a handwritten Dutch document about a 1728 visit of the Opperhoofd (Chief) of the Dutch East Indian Company in Ayutthaya, Theodorus van den Heuvel, to the burning site of a Queen in Ayutthaya. On the day before the procession to the Meru, van den Heuvel met the King in the tower, later describing what he saw, and the next day he saw the procession and described it, too.